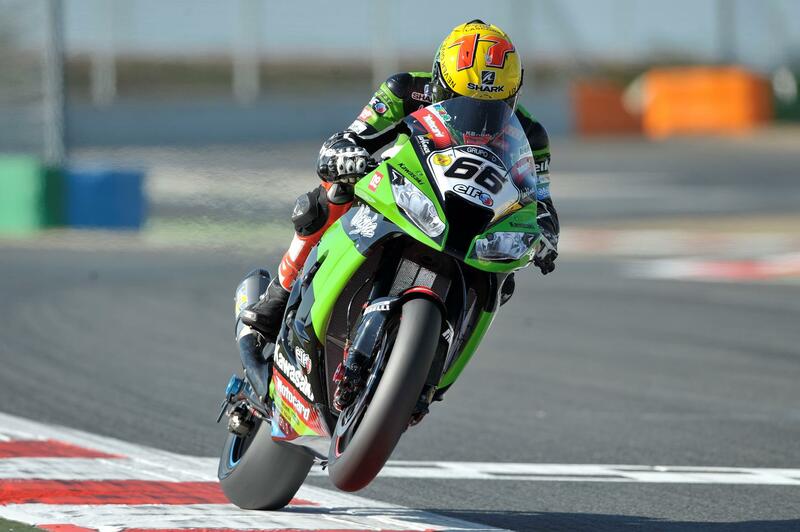 Kawasaki’s Tom Sykes secured pole position, smashing the lap record with an outstanding Superpole lap, while championship rival Max Biaggi struggled finishing an unexpected 10th. Sykes took his ninth pole position of the season, setting the new circuit best lap with a 1.36.950. Factory Aprilia rider Biaggi failed to make Superpole three, unable to link a hot lap together in Superpole two with a best time of 1.38.095 and will start tomorrow’s race from the third row. Biaggi’s team mate, Eugene Laverty will join Sykes on the front row; qualifying third behind Ducati mounted Carlos Checa. Laverty admitted he was surprised to qualify on the front row, he said: “I didn’t think we had the pace for the front row, we’ve only just been in the top ten all weekend, so was thinking second row, I’m really happy with a front row start for tomorrow”. Brits Jonathan Rea, Leon Haslam and Chaz Davis secure second row starts, finishing sixth, seventh and an impressive eighth for Chaz who is lacking track time due to mechanical issues on Friday and a crash this morning. Crescent Suzuki’s Leon Camier starts on row three in ninth position alongside title leader Max Biaggi in tenth. Championship contender Marco Melandri looked back to best after his recent dip in form, qualifying on the front row for Sunday’s two races.